One of Netlify’s goals is to reduce the friction in deploying web projects. We believe that by making this task as simple and routine as possible, developers can turn their attention to the parts of their projects where they need to be truly creative. Allowing them to focus on what they are building, and to differentiate themselves from their competition. This is why we created a deployment process which sits atop the common development workflows which exist already. By hooking into standard Git actions, deployments can be a natural extension of the activities developers perform on a daily basis. Deploying should not be daunting. It should be mundane. The excitement should come from releasing something new to the world, not from wondering if the release is going to work as planned. It is wonderful to see people using Netlify to good effect. And to observe that their deployment processes become routine. Our low friction deployments even cause some to crack wise about it. This made me smile broadly. Not just because it hinted at scheduling and triggering builds and deployments – something of a sweet spot for Netlify – but also because it described a site which could tangibly demonstrate the benefits of a confident and automated approach to deployments. So, when Zach playfully suggested that something as dynamic as a clock could be served up by a pre-rendered site… I had to work quite hard to resist taking the bait. And I was doing so well. …Builds so cheap you can set your clock by them. Yes, I took the bait. I decided to look at what could happen when continuous deployment is so mundane, so solved, so predictable, that I could deploy with confidence every day. Every hour. Every minute. Crazy? Perhaps! Recommend? No. Not every single minute. But… possible?! I stole the idea from Zach. I stole the name from Chris. I regret nothing. Thanks to Netlify’s intelligent CDN, a visitor to the site can automatically be shown the page with has been set to correspond to their country. The configuration for that is simple, but powerful. Of course, each build, and the time shown in each location, will only be correct for a minute. So this is where I’m getting a bit silly. I rebuild and redeploy a new version of the site every single minute of every day! Let’s be honest. This is overkill. But it proves a point nicely. The build of this site is very light. It uses a site generator to pre-render around 20 simple pages, so I don’t feel too shady rebuilding it so frequently via a webhook and a cron job running on webtask.io. But it’s not a frequency that I’d generally recommend. I’m being a little extreme in order to illustrate a point. If this were a heavy build which performed a lot more actions and perhaps called in data or content from APIs, or performed all sorts of image manipulation and compression… I’d probably not sleep so well unless I throttled back the frequency of the builds a touch. On Netlify, a build and deployment can be triggered easily and you can have great confidence in the result. Deployment friction is reduced to zero. Routing users to the resource appropriate for them, depending on their locale, is surprisingly simple with Netlify. And when combined with a site which has been pre-rendered with a site generator, it can work wonderfully for localization and internationalization. Thanks to the expanding JAMstack ecosystem, with resources providing integrations via webhooks, APIs and microservices, we are seeing an increasing number of ways to creatively combine services. Doing this with confidence and with little friction creates huge opportunities. 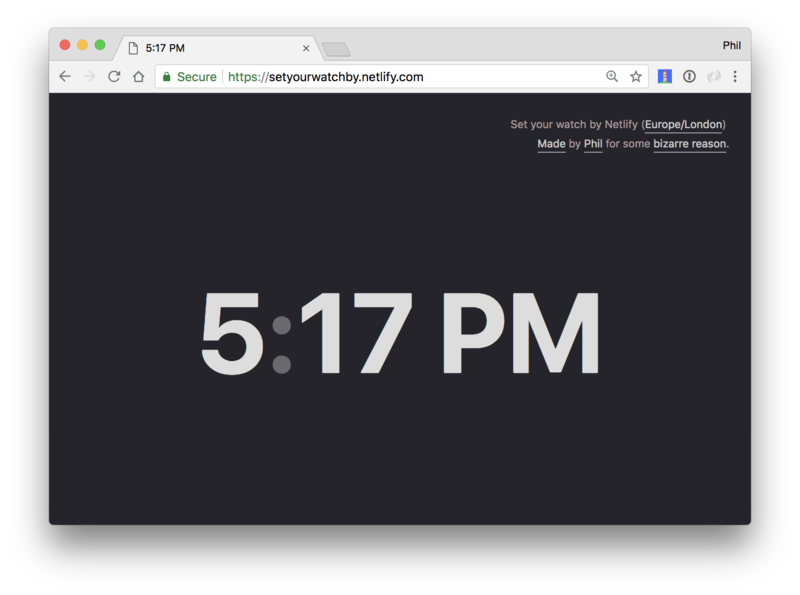 You can take a look at the code for this pre-rendered HTML clock, complete with the localization rules for the CDN in its GitHub repository. But if you just want to know the time..? There is probably a slightly more convenient clock near by.